This lesson plan includes a lead-in activity and several ideas for practical ESL activities and games. Feel free to use the ideas here as a stand-alone lesson plan or to supplement an existing one the past simple negative. The recommended way to view these materials is through the TEFL Handbook app, which gives you offline access to everything on the site. The board work below shows one way to introduce the target language for this lesson. 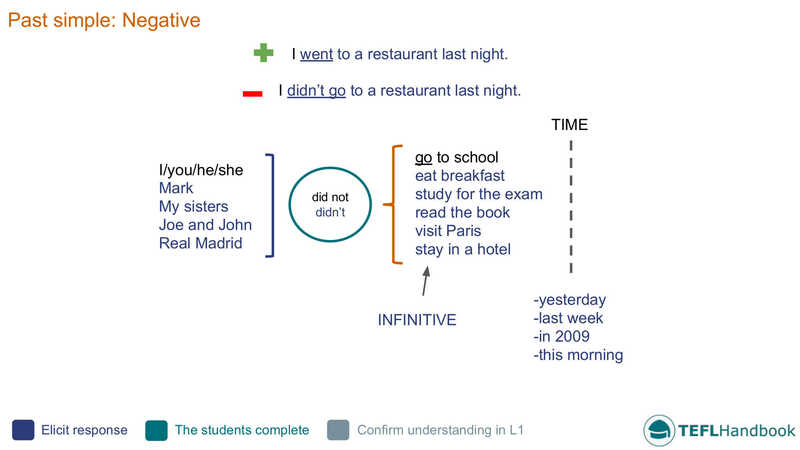 Start off by writing a basic affirmative past simple statement and eliciting its negative equivalent. After that, you can use the visualisation to step through some more examples. If you can, lean on the students' L1 and have them translate some simple statements. This ESL speaking activity will help reinforce the new language. On the board, create a table with two columns that take up the full size of the board. In the table headings, put a plus sign on the left and a minus on the right. Have the students copy this table and then complete it with five affirmative sentences along with their negative equivalent. Encourage your students to make them as funny and creative as possible. Mary didn't go to the cinema by car, she walked. The student has written: I didn't go hiking. Asks their partner: Did you go hiking on your last holiday? Demo this with a strong student first and inform the class that they should record notes on their partner's responses. They will have to report back for the next activity. Monitor the students throughout and correct any mistakes. This next speaking activity follows on from the previous exercise. Students will use their partner's answers to report what they did or didn’t do on their last holiday. They should be able to give you a past simple statement for each item on their list. We can modify the classic snowball darts ESL game to test irregular verbs in the past simple. Start by drawing a circular target on the whiteboard with several concentric layers of different score values. Crush a blank piece of paper into a snowball shape. 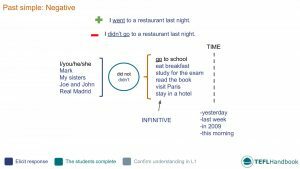 On each turn, ask a student to spell an irregular verb in the past simple. If they get it correct, they can throw a snowball at the board. Keep the scores on the board and depending on the size of the class, play as an individual or team game. You may need a list of irregular verbs for this game. The students should also have a copy to study. Our suggested next lesson is past simple: questions with be. If you've found these materials useful, be sure to check out our full list of elementary ESL lesson plans, A2 Lower and A2 Upper. For other levels, have a look at our complete selection of EFL - ESL lesson plans. If you use an iOS or Android device, try out the TEFL Handbook app. An ESL lesson planner for English teachers. It has a lot more content and gives you faster access to our ESL resources, making it easier to use in class.